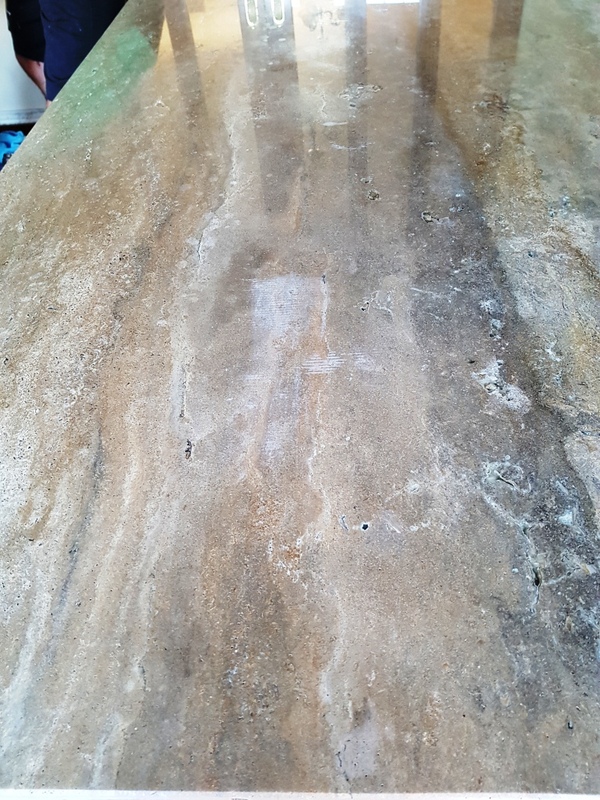 One of my customers for who I recently polished their Marble floor was over the moon with the results and wondered and if I could achieve the same effect with a Travertine table which had many scratches to the top. The table was at his house in Heswall which is located on the Wirral, on the Eastern side of the Dee Estuary with lovely views across the river towards North Wales. The table was a lovely piece of stone furniture, but I could see it was badly marked, scratched and had lost much of its surface sheen. 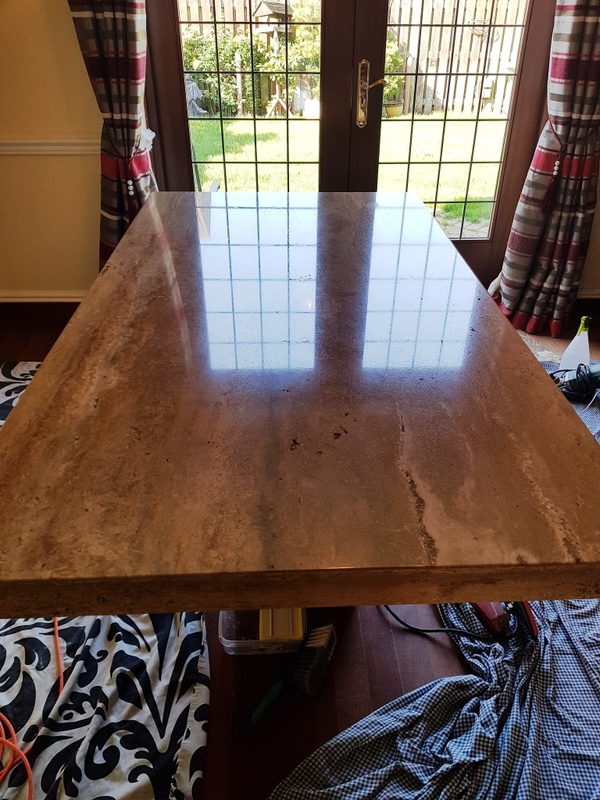 Whilst this was a slightly unusual request, the polishing process works equally well on any type of stone so apart from the physical issue of working on a raised surface, I couldn’t see a problem with working on the table and anticipated that it would come up quite well. We agreed a cost and I arranged a time to come back and complete the job. When polishing floor tiles, I would normally use large Tile Doctor 17-inch diamond encrusted burnishing pads fitted to a rotary floor buffer, naturally that simply wouldn’t work on a table however, I do have a small hand-held buffing machine that’s perfect for getting into small spaces and polishing stone wall tiles which would be perfect for this situation. To restore the polished finish on the table I was able to use the hand buffer together with a set of four 6-inch diamond encrusted burnishing pads of different grits from coarse to very fine. The process involves working through the pads in sequence. I started the polishing with the coarse 400-grit pad and a little water, this coarse pad removes the scratches and ingrained dirt. The table was rinsed down and then the 800-grit medium pad was applied which is the first step in the polishing process. Again, this pad is applied with water to lubricate and the table was rinsed down afterwards. 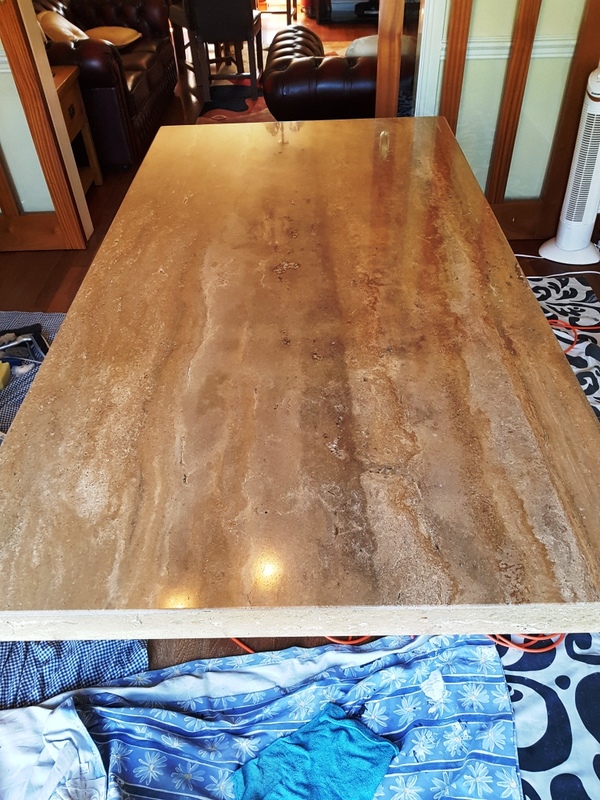 The process was repeated with the 1500-grit fine pad and then the 3000-grit very fine pad to bring up a really nice shine to the Travertine table, I should mention the last pad is applied dry with only a tiny amount of water sprayed onto the surface. The last step was to seal the stone to protect it going forward for which I used two coats of Tile Doctor Colour Grow. The sealer is rubbed into the top then the excess polished off after ten minutes. Once the sealer was dry the table surface was then buffed with a white pad to bring up the finish even further. The client was really pleased with the result, the table looked like new; he was so glad he had asked me to look at it following the work on his floors. 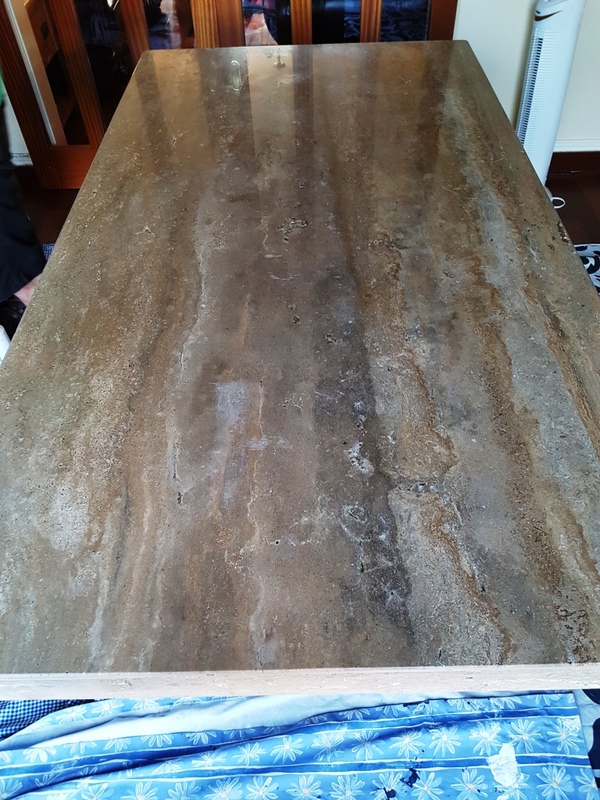 Before leaving I talked to him about the best way to look after his table in the future and recommended for regular cleaning that he use Tile Doctor Stone Patina Spray which has been especially formulated for the regular cleaning of stone worktops.